Starbucks is an $80 billion company and has grown steadily over the years. It’s five year average growth in sales is 10.7% while the one year growth is reported at 10.4%. The consistency could make the stock attractive to investors. But, as always, the latest report can confirm or change opinions about a stock. The latest report from Starbucks seems to be bullish. This move pushed the stock back towards the upper edge of a trading range that has defined the price action recently. Starbucks said net income fell to $760.6 million, or 61 cents per share, from $2.25 billion, or $1.57 per share, a year ago. The company said it earned 75 cents per share on a non-GAAP basis. After stripping out a 7-cent gain from income tax items, Starbucks earned 68 cents per share, topping analysts’ estimates of 65 cents per share. The coffee giant said revenue rose 9 percent to $6.63 billion, beating Refinitiv estimates of $6.49 billion for the quarter. Overall same-store sales rose 4 percent for the quarter that ended Dec. 30. The company beat same-store sales estimates for China/Asia Pacific. Starbucks reported an increase of 3 percent in the region, with transactions growing by 1 percent. In China, in particular, the company saw transactions drop by 2 percent, while stores open at least a year increased sales by 1 percent. Despite investor concerns about slowing growth in China, the company remains optimistic. It increased its number of stores in the country by 18 percent during the quarter. “We believe we’ve built a strong foundation in the last 20 years in the China market and are well positioned to navigate any fluctuation that may take place,” John Culver, president of international, channel development and global coffee & tea. The company’s weakest sales came from its Europe, Middle East and Africa segment. The region’s same-store sales and transactions both declined by 1 percent. The company has added 324 stores in the region since last year. 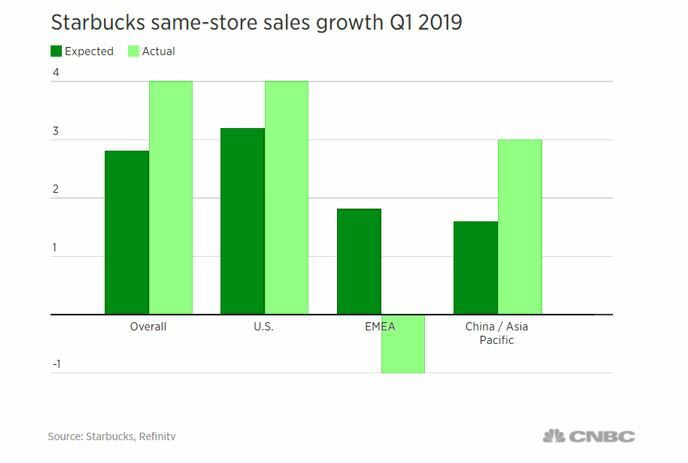 Starbucks narrowed its outlook for fiscal 2019, saying it now expects same-store sales growth to be between 3 and 4 percent globally. At its investor day in December, the company reaffirmed its previous outlook of same-store sales growth near the lower end of 3 to 5 percent. Starbucks is forecasting net income between $2.32 to $2.37 per share for the fiscal year. The company did boost its adjusted earnings forecast, thanks to income-tax items. It now expects to earn between $2.68 and $2.73 per share. It previously estimated adjusted earnings of $2.61 and $2.66 per share. It also expects revenue to grow by 5 to 7 percent during fiscal 2019. Prior to the announcement, analysts had been calling attention to important metrics to focus on. “If the U.S. [sales growth] is reaffirmed by management, the quarter could have been been better-than-expected,” Markus Hansen, senior analyst at Vontobel Quality Growth told TheStreet. Starbucks has “an ability to beat,” he added. As for the results, “If the U.S. comparable is good and China is okay, the market will be happy paying this multiple for the stock,” Hansen said. For China specifically, Goldman Sachs analysts wrote “a negative result could limit longer-term investors willingness to buy on any softness” in a note out ahead of the report. With these milestones met, it could be time to buy SBUX. Analysts may be following up the report with their own revisions and that could be bullish given that the report itself was strong. The long term chart of SBUX places the recent stock price action in context. Notice that there was a strong rally from 2009 to 2016 and since then the stock has been consolidating. The breakout in 2018 has been followed by an additional period of consolidation and that is not unexpected. The breakout in 2018 might have allowed buyers from the previous three years to take profits. Many investors like to sell when they have a chance to break even or enjoy a slight profit after an extended holding period. An investor who bout in 2016 would have seen the stock pull back and basically move sideways for two years. After that long of a holding period without a significant gain the investor might have sold on the breakout and that could result in a consolidation. However, with the recent good news and the company’s optimism about growth, it could be time to take a fresh look at the stock. A buyer could begin to establish a position and consider a stop loss under the recent range. Risk could be about 10% with that strategy although there is no assurance that the stop will limit risk to precisely that amount. However, that could be a reasonable amount of risk for a stock with so much potential. Our goal in this article is to provide useful information that could help you become a better investor. We have also studied the great investors and closely follow the work of Warren Buffett who may be the greatest investor of all time. In fact, we have prepared a special report on Warren Buffett that we believe you may find useful. You can obtain this free report by clicking here.